On March 3, 1947, in the maternity ward of Beth Israel Hospital in Newark, New Jersey, Archibald Isaac Ferguson, the one and only child of Rose and Stanley Ferguson, is born. From that single beginning, Ferguson’s life will take four simultaneous and independent fictional paths. Four Fergusons made of the same genetic material, four boys who are the same boy, will go on to lead four parallel and entirely different lives. Family fortunes diverge. Loves and friendships and intellectual passions contrast. Chapter by chapter, the rotating narratives evolve into an elaborate dance of inner worlds enfolded within the outer forces of history as, one by one, the intimate plot of each Ferguson’s story rushes on across the tumultuous and fractured terrain of mid twentieth-century America. A boy grows up-again and again and again. 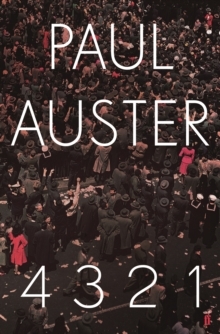 As inventive and dexterously constructed as anything Paul Auster has ever written 4 3 2 1 is an unforgettable tour de force, the crowning work of this masterful writer’s extraordinary career.